Managing how your remote desktop is displayed on the device you are connecting from is easy thanks to the 'Resolution' slider in the 'Display settings' of the session menu. 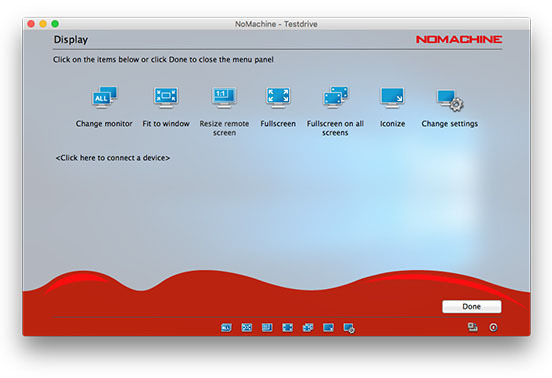 In most cases, NoMachine will display the remote screen according to the preferences you have enabled with the 'Fit to Window' and 'Resize remote screen' options. Sometimes, however, the user might prefer to manually resize the remote desktop so that it uses the available space on the client screen. 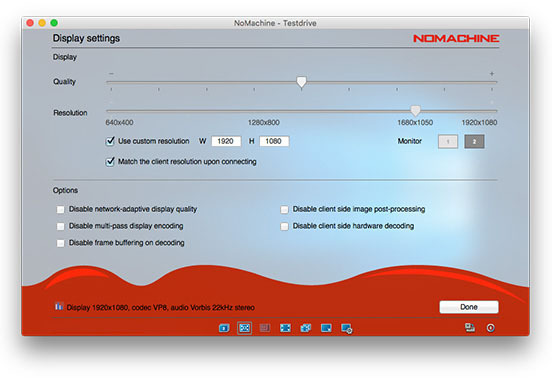 Open the NoMachine session menu (Ctrl-Alt-0 or page-peel) and click on 'Display', and then 'Change settings'. NoMachine will indicate on the slider the standard resolution options found on the server-side list of supported dimensions. Move the slider according to your preference (Fig. 2). If any of the resolution options indicated don't fit your needs, you can specify a custom width and height, and NoMachine will resize the remote desktop to the given resolution or to the nearest one (Fig. 3). Additionally, in remote desktop sessions to multi-monitor set-ups, you can even set a custom resolution ad hoc per display. If multiple monitors are detected, small monitor icons will show up on the right. Select the monitor to set its resolution. A further option 'Match the client resolution upon connecting' will resize the remote desktop to the biggest resolution among the available ones to fit in your client monitor every time you connect. Tip: If you have 'Fit-to-window' enabled, you can automatically scale the contents to fit the window and preserve the aspect ratio of the remote display simply by holding the 'Control' key and dragging the corner of the window.